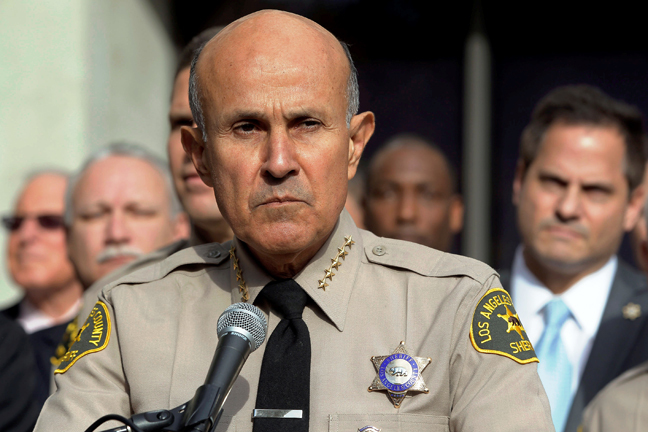 Longtime Los Angeles County Sheriff Lee Baca who has been under siege with FBI investigation and deputy misconduct will resign after 48 years, he announced on Tuesday. Baca will leave the department at the end of January, he said. Flanked by deputies, family and supporters, Baca made it official at Sheriff Department Headquarters. “I’ve been proud and honored to serve the Los Angeles County Sheriff’s Department and the people of this greatest of counties, Los Angeles County, for the past 48 years,” Baca said, his voice occasionally cracking with emotion. Baca, 71, was first elected in 1998 and was facing a tough re-election campaign this year for his fifth term, including a challenge from one of his former deputies. Baca denied that his decision to step down was prompted by the possibility of federal charges against him, but the looming allegations have brought about the darkest cloud during his tenure. Eighteen current and former deputies were recently indicted on a variety of charges, including mistreating jail inmates. “My decision is based on the highest of concern for the future of the sheriff’s department,” Baca said. He said he was recommending that the Board of Supervisors appoint Assistant Sheriff Terri McDonald to oversee the department once he steps aside. Baca had announced Monday January 6 that he would support a citizens' commission to oversee department operations. A local newspaper in December revealed that the department hired dozens of officers in 2010 despite evidence of significant misconduct found during their background checks. Subsequently, Federal prosecutors filed charges against current and former deputies in December, accusing them of beating jail inmates and visitors and trying to intimidate an FBI agent. The charges related to a long-standing corruption investigation of the jail system, which was administered by the sheriff’s department. The department is also facing civil lawsuits relating to the actions of some of the deputies charged with misconduct. Additionally, the U.S. Justice Department last year accused sheriff's deputies of engaging in widespread unlawful searches of homes, improper detentions and unreasonable force as Antelope Valley authorities conducted an effort to discriminate against African Americans who received low-income subsidized housing. However, Baca was considered as an advocate of the African American community, frequently implementing policies such as educational programs for inmates and launching the innovated Sheriff Clergy Council, hailed as a national model for law enforcement. County Supervisor Board Chair Mark Ridley-Thomas said he spoke with Baca on January 6 and that the sheriff gave him “no indication” he was thinking of stepping down from his post. The supervisor said his feelings about Baca's decision were mixed. The Board of Supervisors will need to appoint a successor to Baca, and staffers are researching the requirements for the post. Ridley-Thomas said the list of potential appointees would include all the assistant sheriffs, adding Assistant Sheriff Cecil Rhambo’s name to the speculation. But the supervisor said he wasn’t ready to comment on the campaign. Four challengers are declared to run for the post in a primary election on June 3, and a potential general election on Nov.4.